Welcome to the Newport Mansions Press Room. Here you'll find press releases, story ideas, background information and photography guidelines and policies. Our experienced public relations staff is available to answer your questions, arrange interviews and photo shoots and give you any other assistance you need. Please let us know how we can help you. Commercial and editorial photography for publication may be permitted with advance written agreement. Notable films from True Lies to The Great Gatsby to Amistad have been shot here. Top networks and producers from ABC to the Travel Channel have produced programs and segments in and around these stately and enchanting grounds. Commercial photography for many applications can also be arranged, along with wedding photography. Requests for commercial or film photography should be directed to the Preservation Society's Special Events office via email to events@newportmansions.org , or call (401) 847-1000 ext 120. Editorial photography requests (ie, to accompany travel articles or broadcasts featuring the Newport Mansions) should be directed to Communications Manager Andrea Carneiro via email to btavares@newportmansions.org or (401) 847-1000 ext 131. The Preservation Society now allows interior photography at all the Newport Mansions, with the exception of Hunter House. Photography is only allowed when it does not disrupt the quiet enjoyment of the properties by other visitors. No flash, tripos or selfie sticks are permitted. Photographs are permitted only for non-commercial and social media uses by visitors. No commercial use or sale of images is permitted without separate, prior written agreement with the Preservation Society. During guided and group tours, stops for brief photo ops will be allowed as time permits. Guests using audio tour devices may use their own discretion in taking time for photographs unless they delay other guests. Visitors may not record guides giving their presentations. At no time may visitors step beyond the roped boundaries of the tour route. Photo ops may be limited when there is high volume visitation. In all cases, visitors must follow the direction of house staff about photography. Photography during programs, lectures and receptions will be allowed on a case by case basis. The use of drones over Preservation Society properties, even equipped with smart devices, remains completely prohibited, regardless of whether the controller is on or off Preservation Society property. 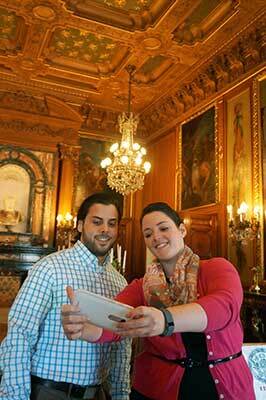 Visitors to the Newport Mansions are welcome to photograph or videotape the exterior of the houses and their grounds for their own personal use. No commercial use of any photographs taken on the grounds is permitted except with advance written permission from the Preservation Society.